February weather in the Tampa Bay has brought massive amount of people out to the Sunday's monthly Tampa Indie Flea. Since the Armature Works opening just a month before, the Tampa Heights region hasn't seen the action within the area like they did on Sunday. Foot traffic was on every block from N. Florida Ave to the Riverwalk, from the Hall of Franklin through beautiful native inspired garden of Ulele to family friendly Waterworks Park, right up to the plaza of the new Heights Public Market. I found myself looking both ways before crossing the busy Tampa Street, only to be waiting for a family of cyclists, not vehicles peddling down the road. Where am I? Wasn't this just maybe a year ago, that no one would even think of having their eight-year old ride their bike anywhere near north of downtown Tampa. I made my way to my first Tampa Indie Flea and I was astonished how the weather and creative brands within the Armature Works event made me feel. As I walked up to the south entrance; I turned back and looked down the Riverwalk sidewalks of all the pedestrians, which made me smile. I noticed the bicycle racks filled to the max thinking of all the people residing in downtown Tampa, Seminole Heights, Tampa Heights, Ybor City, Harbor and Davis islands that could have potentially chosen to ride their bike to the venue. Vendors filled up the entire Armature Works main Hall space and the smell of cedar filled my senses as I started to make my way around. I was happy to see too many familiar faces from all walks of my professional and personal networks. It's nice to know we are all enjoying the same regional spirit together. I was able to stroll around the entire event within an hour and a half, but not without speaking to numerous brands with individual flavor and start-up stories. I want to share with you the eight brands that complimented my menswear lifestyle. Enjoy and make sure if you connect with them and mention The Alvarado Experience. I fell in love with the decorative stimulation my eyes laid upon with this brands cell phone cases and leather goods. Leather has many forms and I think this artist has found a way to create each piece of leather into a one of a kind piece. Customization is available and the amount of patience I witnessed by the creator during the Indie Flea was simply astonishing. I love how a few lines and circles can transform a work of art on many canvases such as these. This Saint Petersburg, Florida brand comes with lovely leather hand bags, iPad sized hand bags, and messenger bags, and large purses. I was pleased to see the handmade products were locally created and sold with the masterminds of cute couple. I am totally going to be investing in one that holds my iPad and business cards for those days that I don't want to carry around my messenger bag. I thoroughly enjoy seeing couples create and hustle together; whether its on the same direction or down their own personal passion projects. Jacob Zepf and Seth Daniels have combined forces to create Freehand Goods, based out of Orlando, Florida. This was first brand I met who were excited to come to the Tampa Bay market to sell their items. They recognized the consumers here loves a more creative substance to shop from. Freehand Goods offered grooming products, handmade leather goods and some dry products that includes shirts, hats, travel bags and candles. They were inspired by the essence of basic Florida style men's accessories with a unique feel; usually brainstormed after a few evening beers, as do all great ideas usually occur. They started as a pop-up on top of a 1978 U.S. military trailer parked on the side of the road. But once the craft was born and people were able to view the detail oriented items; Freehand Goods took off and hasn't looked back. 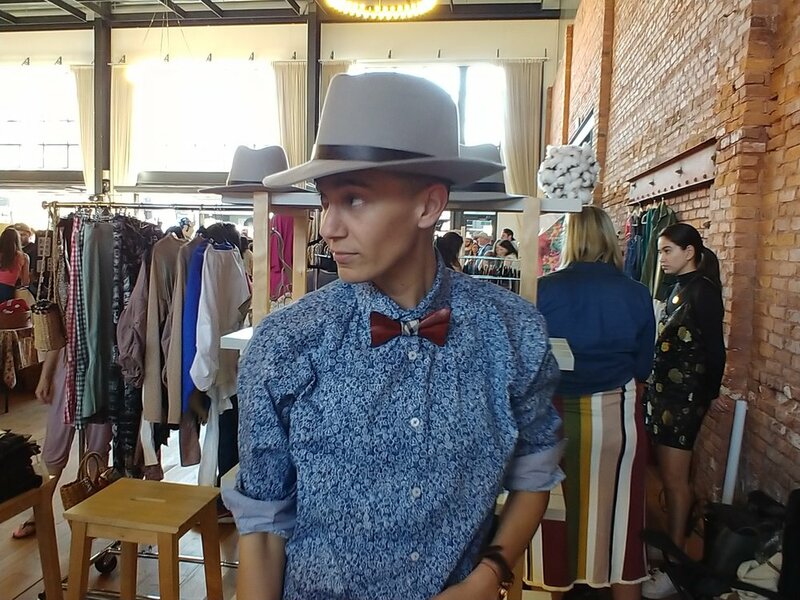 Trent also came from Orlando, Florida and I was excited to find this amazing light grey fedora with versatility in style. With just a steamer, you can adjust the brim making whatever divots and brand variations you can think of. I love how the hat seems to have a natural ability to be worn in a sharp looking suit or a more casual look, such as his amazing dark denim he also designed. His brand includes various basic clothing made with 100% organic materials made right here in the United States. His inspiration stems from a growing up in a family who wasn't concerned with high fashion but more simplistic wardrobe. Making functional shirts, sweaters, denim and dresses. His minimal style really fit my personality and style. Trent and I have some great ideas for future collaboration. The engineer inside my brother and I gravitated to rush over and look at IJM Industrial Design. Innovative creativity for art, engineering and decor collide to create shapes, gears and useful lamps. Using construction materials to create art has always stolen a place in my heart. The rustic masculine feeling of the design and power compliments my style and I enjoy hearing the stories of the people who have the patience to create such items. As a structural engineer, I designed large multi-story structures for many different markets and there is a critical life safety aspect to the engineering that is not necessarily regarded when your are making art. Unless the art is huge as I have seen from some local artists. But at any rate, this father and son team have their hands full and I was excited to see this brand represented in new Armature Works, a industrial modern representation of a piece of Tampa Bay's history. Skateboarder inside my soul will never go away and this is why I am thankful for the creative mind of Travis Knight with his brand Trillions and Counting. He takes old skateboards and creates unique pieces of art. Transforms some skate decks in it's entirety with painted works to broken boards and cut outs from boards to create characters and other objects that reflect the world he lives in. Travis is the brother of an amazing friend of mine and it was my pleasure with share his brand. Information about custom or other unique pieces; you can reach Travis at the links below. Accessories from Miami, Florida are here! Lovely wooden sunglasses, bowties, flower lapels and super cool wood and cork watches had me wanting them all. They pride themselves in creating accessories out of re-purposed materials such as wood, vinyl, denim and cork. There is a creativity that shines through in the art of making these accessories and it was evident their passion came through the finished products. Style Tip: accessories are amazing pieces to add to your outfit; just be cautious of wearing too many at the same time. I got a chance to talk to the TV-Head Co. owners, who have pieces in a boutique in Wynwood Shop, and they just loved coming to the Tampa Bay Market as well. They mentioned that Tampa Bay customers really appreciate the art of making. It's a great feeling when the customer and brand have an amazing experience to share. Thanks for Tampa Indie Flee bringing brands from all around Florida. Erica was a breathe of fresh air as I was checking out all the other menswear inspired brands. I got a chance to connect with her just one day before the Indie Flee, from my routine visit to LaFrance boutique in Ybor City. Her card was provided to me as someone to check out her bowties for men and women fashion. I was pleasantly surprised by her passion for the environment and a way to create artistic fashionable pieces that complement men and women in a genderless way. Her essence and purity of truly wanting to save the world, and look good while doing made me smile and have butterflies of what our utopia could look like for the future generation. I am excited to present Erica's personal passion project of Sewn Apart to you with upcoming collaborations.